The heads of seven of the nation's biggest banks were on Capitol Hill today testifying about how the industry has changed 10 years after the financial crisis. Democrats also grilled them about overdraft fees, mortgage lending and even their own paychecks. NPR's Jim Zarroli reports. JIM ZARROLI, BYLINE: When California Democrat Maxine Waters became chair of the House Financial Services Committee this year, she promised to hold the nation's largest banks feet to the fire. Today she got her chance, calling the titans of Wall Street to testify. She noted that it was the first time so many bank CEOs had been summoned to a hearing since the financial crisis. MAXINE WATERS: A decade later, what have they learned? Are they helping their customers? Or are the practices of these banks still causing harm? ZARROLI: One by one, the CEOs assured the committee that the financial system has grown healthier and more stable than it was. New regulations have forced the big banks to curb risky lending practices. Here was JPMorgan Chase CEO Jamie Dimon. JAMIE DIMON: While you'll never lose sight of the lessons learned, post-crisis reforms have addressed key concerns. ZARROLI: And the banks are doing well. They're enjoying healthy profits right now. And for Democrats, that raises questions about what they're doing to protect their customers. The CEOs were pummeled with questions about small business lending, high overdraft fees and diversity efforts. 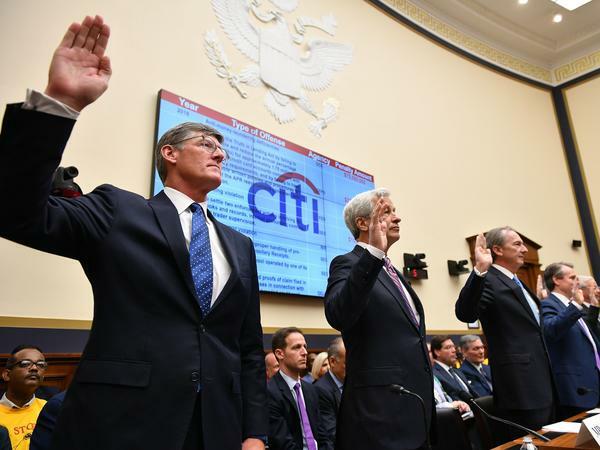 Citigroup CEO Michael Corbat faced some awkward questions about his salary. Democrat Nydia Velazquez of New York noted that he had made $24 million in compensation last year. The median salary at his bank, she noted, was less than $50,000. NYDIA VELAZQUEZ: So let me ask you this question. If you were an employee and you saw your boss making $486 for every dollar you made, how would you feel about that situation? ZARROLI: Corbat answered her carefully. MICHAEL CORBAT: I would be hopeful that there's opportunity to continue to advance within the firm. ZARROLI: Velasquez then cut him off, saying, this is why people who live in a bubble or an ivory tower can't understand why there's so much anger out there. Democrat Carolyn Maloney took CEO Dimon to task for high overdraft fees at his bank. CAROLYN MALONEY: You're essentially gouging your most vulnerable clients - the ones that are living paycheck to paycheck. ZARROLI: Dimon replied that customers who want overdraft protection have to opt-in by asking for it. For the most part, the questions from Republicans were a lot less antagonistic. Many talked about how the big banks played an indispensable role in the U.S. economy. Ranking Member Patrick McHenry said banks are earning big profits today but only because the economy is doing well. PATRICK MCHENRY: I can tell you this. The economy has grown. The labor market is strong. That, too, is positive. The U.S. added nearly 200,000 jobs in March, a move The New York Times recognized as a return to solid growth. ZARROLI: McHenry suggested that Democrats were using the hearing to score political points. It was a hearing, he said, in search of a headline. MCHENRY: I fear my colleagues on the other side of the aisle are here to attack our economic system. I fear my friends want to dictate social and environmental policy through government mandates on banks. That's not the right approach. ZARROLI: McHenry said the committee would better spend its time on some of the more pressing issues facing banks today. They include the impending departure of Britain from the European Union and the impact it might have on the U.S. economy. Each of the CEOs said Brexit was a challenge but not enough of one to threaten the financial system. Asked what was the most serious issue they face, they talked about cybersecurity - how to protect their bank's assets at a time when hackers routinely try to breach their defenses. That, they suggested, is the problem that keeps them up at night. Jim Zarroli, NPR News. Transcript provided by NPR, Copyright NPR.